All good writing follows a style manual. These literary anchors add order to the sometimes-untidy universe we writers and editors inhabit. They salt our books with wisdom and pepper them with grace. Whether it’s The Chicago Manual of Style, The Associated Press Stylebook, or APA Style, every writer should use one. Journalists use AP style, authors tend toward CMS, and writers in scientific fields lean on APA. I’ve learned all three, and I appreciate the merits of each. I know AP style best, thanks to my journalism school, where my required copy editing course went like this: make one mistake on a test, get an “F”. The Medill F seemed harsh. Nightmares about it can linger into middle-age. But it worked. Ask any Medill graduate about AP style, and chances are they know much of it without referring to the manual. It’s best to stick to the style preferred by your editor or publisher. Otherwise, you risk the painstaking task of retrofitting a manuscript. Though style manuals are important, they’re not often fun. Until now. 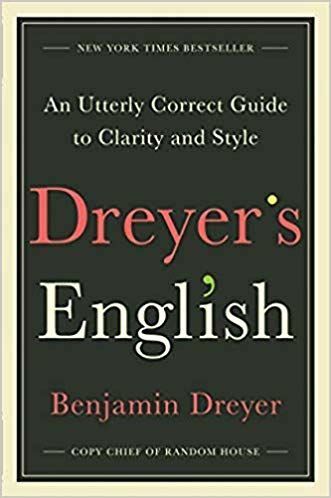 Dreyer’s English, by longtime copy editor Benjamin Dreyer, is essential and fun. A vice president at Random House, Dreyer presents must-have material in a witty, engaging way. I’m only two chapters in, and I agree with all he’s said. For a week, hunt them down and strike them from your copy, Dreyer says. No, don’t leave that last one intact because it looks cute and helpless. And if you feel that what’s left is somehow missing something, figure out a better, stronger, more effective way to make your point. Getting rid of these “Throat Clearers,” as Dreyer calls them, will improve your writing. Removing them from your work is in the spirit of ferocious self-editing, a term coined by author Jerry Jenkins. We writers need to be ruthless as we sharpen our own work. The English language … developed without codification, sucking up new constructions and vocabulary every time some foreigner set foot on the British Isles–to say nothing of the mischief we Americans have wreaked on it these last few centuries–and continues to evolve anarchically. It has, to my great dismay, no enforceable laws, much less someone to enforce the laws it doesn’t have. That the French have had for centuries an académie that keeps a sharp and controlling eye on their language is why it’s easier for a modern French speaker to read and understand Molière than it is for a modern English speaker to read and understand Shakespeare. This explains why I needed Shakespeare Made Easy books when I started studying The Bard in sixth grade. His vernacular is confusing to modern readers. A governing body that eliminated the confusion would be helpful. Then again, and as Dreyer points out, rules are made to be broken–once you’ve learned them. 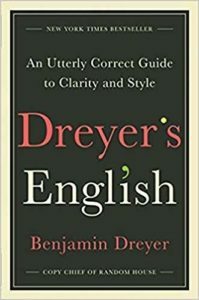 If you’re a writer, an editor, or aspiring in that direction, get a copy of Dreyer’s English. It won’t disappoint.